Had just a couple of hours free yesterday (April 25, 2014) while in Sheboygan for March of Dimes, and used the opportunity to update some photos and to visit new sites. I was lucky again to have perfect photography weather! This photo of the Sheboygan Civil War Memorial is my favorite of the day. The memorial is one of the most elaborate in the state, and it's right here in my own backyard! Along the Michigan Lakeshore, and especially at Sheboygan's Deland Park, are quite a few markers describing various shipwrecks. Special attention is given to the lumber schooner Lottie Cooper, which sank off the Sheboygan piers April 9, 1884, in a "raging easterly gale". Her skeletal remains, discovered during construction of the Harbor Centre Marine in 1992, are a permanent outdoor exhibit at the entrance to Deland Park. Numerous markers on site record her construction, heyday and demise. In addition to all the interesting maritime history markers, there's a fabulous view of the Sheboygan Breakwater Lighthouse from the adjoining parking lot. 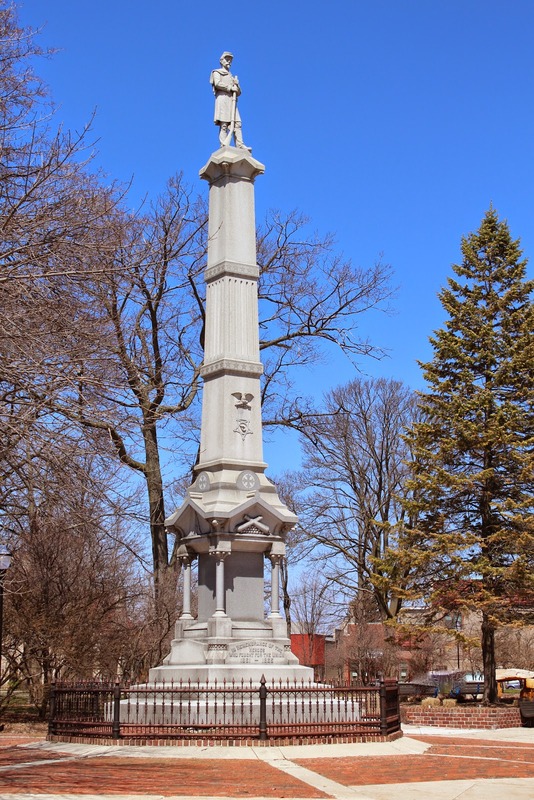 Three Sheboygan County markers / sites have been updated; there are 15 new posts. Enjoy!